WHEN CHESTER ALAN ARTHUR became president of the United States, everyone knew what to expect — and it wasn't good. Arthur was a thoroughgoing hack. He was a partisan crony who had risen to influence as a loyal henchman of Senator Roscoe Conkling, the arrogant and ruthless boss of the New York Republican machine. The prospect of Arthur in the White House, lamented the Chicago Tribune, was "a pending calamity of the utmost magnitude." As the eminent diplomat and historian Andrew Dickson White would later recall, the most common reaction to the news in political circles was: "Chet Arthur, president of the United States?! Good God!" But Arthur surprised them all. The sleazy insider redeemed himself. He governed honestly and conscientiously, putting country ahead of party and turning his back on the win-at-any-cost cynicism in which he had marinated for so long. On this Presidents Day weekend, the story of the nation's 21st president offers a reminder that power doesn't have to reinforce a political leader's worst inclinations. Sometimes it can awaken the best. THREE YEARS before he was elevated to the highest office in the land, Arthur's political career appeared to be wrecked beyond repair. In the summer of 1878, President Rutherford Hayes had fired Arthur from his job as collector of the Port of New York, one of the most lucrative positions in the federal government. Conkling had originally recommended Arthur for the job, and Arthur had milked it for the benefit of Conkling's machine. The nation's largest custom house became a hive of rigged hiring, illegal kickbacks, and political patronage: the spoils system at its most brazen. During political campaigns, every employee was required to pay an "assessment" — a cash contribution to the Republican Party. Jobs went to party loyalists, who routinely passed the application exam with flying colors — even when they didn't know any of the answers. By the 1870s, disgust with the spoils system was rising in both parties. Hayes, a leader of the GOP's reform wing, had run for president on a platform of dismantling the sleazy arrangements perfected by Conkling's machine. On his first day in office, he had called for "thorough, radical, and complete" reform of federal hiring. He instructed the Treasury Department to investigate political manipulation and fraud at the nation's custom houses, and when it produced a scathing report on the unscrupulous practices in the New York Custom House, Hayes sacked the man who ran it. Yet "rather than ruining Arthur's career," as Arthur biographer Zachary Karabell writes, "Hayes's vendetta catapulted him to national attention." He became a hero of the "Stalwarts," the anti-reform faction of the Republican Party. In 1880, Arthur led the New York delegation to the Republican national convention in Chicago. He and the other Stalwarts couldn't prevent the party from nominating another reformer to succeed Hayes — the widely-admired James A. Garfield. But Garfield knew he couldn't win the election if he didn't carry New York, and New York — Conkling's empire — was Stalwart territory. 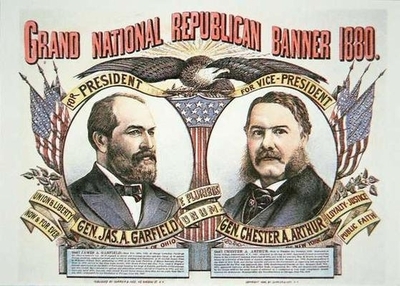 To balance the ticket, Garfield's campaign offered the vice-presidency to Arthur. It worked. The Republicans won the November election, and the following March, Arthur was sworn in as vice president. But even then, he continued as before, looking out for Conkling's interests and not even pretending to back the new administration's reform agenda. On July 2, 1881, in a Washington train depot, a deranged assassin shot the president twice. The gunman, who had delusions of being named an ambassador and was enraged when no offer was extended, convinced himself that Garfield's successor would give him the patronage post he craved. "I am a Stalwart, and Arthur will be President!" he proclaimed. Garfield died painfully and slowly, clinging to life for more than two months. All the while, Arthur was distraught with grief and fear. "I pray to God that the president will recover," he said. "God knows I do not want the place I was never elected to." When word reached him that Garfield had finally died, a reporter knocked on his door to ask for a statement. Arthur's valet had to turn the man away: The new president was "sitting alone in his room sobbing like a child, with his head on his desk and his face buried in his hands." Garfield's assassination made Arthur president, but there was no satisfaction or triumph in it. The awful knowledge that a good man had been murdered so that he could take his place and preserve the spoils system haunted him — and changed him. Conkling and the Stalwarts were shocked by the transformation in their old friend and fellow hack. When Garfield's inner circle resigned, Conkling expected to be offered a top cabinet position. He also expected Arthur to name a reliable Stalwart to run the all-important New York Custom House. But Arthur was no longer taking orders from Conkling, and no longer committed to blocking civil service reform. Having acceded to the presidency as a result of Garfield's death, Arthur said, he considered himself "morally bound to continue the policy of the former president." When he wouldn't budge, a furious Conkling returned to New York and denounced Arthur as a traitor. Arthur was only getting started. In his first Annual Message to Congress, he explicitly called for an overhaul of federal hiring practices. His support astonished those who had assumed Arthur would serenely return to corruption as usual. Around the country, civil service reform groups sprang into action. Democratic Senator George Pendleton of Ohio introduced legislation to mandate merit-based hiring in many federal agencies, and in 1882, Arthur endorsed it. 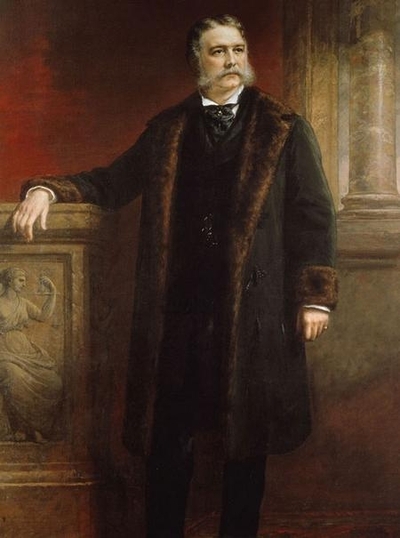 The 1880 Republican presidential nominee, James Garfield, picked Chester Arthur as his running mate as a sop to the New York Republican boss, Senator Roscoe Conkling. Thus did a champion of the Stalwarts drive the first nails into the coffin of political patronage as it had been practiced since the days of Andrew Jackson. Within a month of Arthur's endorsement, the Pendleton bill sailed through both houses of Congress. On January 16, 1883, Arthur — erstwhile flunky of Roscoe Conkling, ultimate creature of raw Republican bossism — signed it into law. He appointed qualified members to the new Civil Service Commission, and firmly enforced the commission's new rules. ARTHUR SERVED only a single term as president. His repentance and conversion to the cause of reform meant breaking with what today we would call his base, and the party leaders he alienated refused to nominate him for another four years. Not that Arthur wanted another term. Unbeknownst to the public, he was gravely ill. He was slowly dying of Bright's disease, a chronic inflammation of the kidneys that at the time was incurable. He would die at the age of 57, just 18 months after leaving office. But while Arthur may have been in physical distress when his presidency ended, gone was the emotional distress that had tormented him at its start. He left office knowing that the American people thought far better of him than they had in 1881. No less a hard-boiled observer than Mark Twain wrote: "It would be hard indeed to better President Arthur's administration." The "pending calamity" so many dreaded when Arthur replaced Garfield hadn't materialized. Instead he had risen to the challenge of leadership — risen above his worst instincts, above his dishonest former comrades, above the habits of greed and partisanship that had defined his career. Arthur isn't reckoned a great president. But he turned out, against all expectations, to be a genuinely decent one. In the 1880s, as in the 2010s, decency in politics was something rare and admirable. Arthur deserves credit for presiding over a watershed reform in the workings of the federal government. But he deserves to be remembered for something else — for proving that even the most polarizing and distrusted politician can choose to heed the better angels of his nature, and become better than he was.